Local municipalities are throwing their support behind efforts to get a portion of Highway 59 twinned. Hanover Reeve Stan Toews said Hanover has approved a motion to lobby the province to complete a study on the feasibility of twinning Highway 59 between Ile des Chenes and Highway 52. Toews said they are requesting a study be completed because he knows no action on the twinning of the highway can go forward until a study is complete. "They haven’t done a study yet and before they can do anything they have to do the study, so that’s where all this is stalled," Toews said. "The biggest piece for us is about the safety," he said. "There is a lot of traffic on that highway and it can become very dangerous especially in the winter." The reeve added he has spoken to a number of municipal politicians in the Southeast and said almost all support the idea. "I hope they take a look at this and this study starts to happen sooner than later," he said. Hanover also recently put out a request asking other local municipalities to support their lobbying efforts. 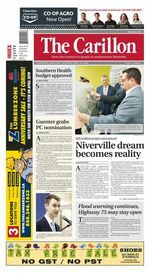 Niverville council voted unanimously last Tuesday morning to support Hanover. "The municipalities in the area have been pushing for this for a long time, and now Hanover is taking another step in this process by putting this motion together," Niverville Mayor Myron Dyck said. "My take is let’s get the functional study complete so we can take the next step and see the results of that study, because the twinning of that highway is important to a lot of municipalities in this region." Dyck said along with safety concerns he also believes the twinning of the highway would be a boost to the provincial economy. "We have to look at the economic development that this part of the province contributes to the provincial economy, and it’s about moving both goods and people that are putting money into the provincial coffers on a daily basis," Dyck said. "In order to do business we need the proper infrastructure, and in turn this would only help the province and their treasury." Manitoba Infrastructure Minister Ron Schuler said in a statement to The Carillon that as of now the province could make no commitment on a study. "Highway 59 is an important route in southeastern Manitoba and as a part of the province’s highway capital planning process Manitoba Infrastructure is currently reviewing its major strategic infrastructure priorities," Schuler said in the statement. "Further investment along this route will need to be balanced with infrastructure investment needs across the province."